Is DCC Right for ME? The purpose of this article is to help you decide if you should use DCC as the means of controlling your model railroad. First I will present a brief overview of what DCC is, how it works, and how it differs from standard layout control systems. Next I'll answer the question "Why use DCC?" Then I will review the various components that comprise a DCC system (including some items the DCC vendors won't tell you about.) I'll also give you some idea of costs and what it is like to operate a DCC controlled model railroad. At the end of the article is a link to a list of websites where you can find more information about DCC. Be forewarned that I have built both standard and DCC layouts, and I am a total convert to DCC. Consequently, this article is definitely slanted in favor of DCC. Also, this article is based on the HO scale, where locomotives are powered by 12V DC motors. Some differences may apply to using DCC in other scales. DCC stands for Digital Command and Control. This means that instead of controlling locomotives by continuously varying the voltage of the current the locomotive's motor receives, you instead send each locomotive a coded digital signal that the locomotive uses to control its speed and direction. In a DCC layout, each loco has a unique digital address, and each loco only responds to signals sent to that address. What this means, in operational terms, is that you can control each locomotive individually, no matter where it is on your layout. Since each loco is uniquely identified, you can simultaneously run as many locos as you want, and you can do so from a single controller by simply selecting the identifying number of the loco you want to control at the moment. With DCC there is no need for electrically isolated blocks of track, or block control switches and indicator lights. Moreover, you need not have separate controllers for each loco you are running: a single DCC controller can run all your locos at once. You can, of course, have multiple controllers is you want to have several people operating locos at one time. Also, as I will explain later, you need not have any physical switches for controlling turnouts, nor do you need a physical control panel, indicator lights, or any of the wiring all that requires. In a standard HO layout the rails carry plain DC current. The polarity of the current determines the direction of the loco, and the voltage determines its speed. Because of this, if you put two locos on the same section of track, they will run in the same direction at the same speed because they both "see" the same polarity and voltage on the rails. In a DCC system the power on the rails is not standard DC current. Instead, the DCC controller breaks the continuous DC voltage up into a series of pulses, and it puts these pulses of DC power on the rails. The DCC controller also has the ability to generate pulses of different frequencies, and it can put multiple frequencies on the rails at the same time. In a DCC system, each loco is equipped with a small circuit card called a decoder. Each decoder has a unique identifying number that is keyed to one of the power frequencies generated by the DCC controller. Consequently, each loco picks up only one of the power frequencies sent out by the DCC controller. This is what allows each loco to be controlled individually: you simply tell the DCC controller which loco you want to control, and then you vary the power (speed) and direction for only that loco, even while other locos continue running at their previous settings. The answer is simple: a DCC controlled layout allows you to operate your trains in a way that is much more like operating a prototype railroad. Specifically, you can run as many locomotives as you like, wherever you like, with no concern for block controls or any other issues related specifically to model railroads. You can control each loco individually, and you can use one, or multiple, controllers at the same time. Even though this sounds like hyperbole, the truth is that DCC is the single biggest improvement in model railroading since the invention of electricity. Of course, the only people who believe that are the ones who are currently running a DCC layout. If you are serious about model railroading, you should be one of them. There are really two types of components in a DCC system: the ones you have to have, and the ones that are nice to have. I'll review all of them here and, for the nice to have ones, give you some reasons why that is the case. First you must have a DCC power supply. Unlike standard Power Packs, a DCC system uses a separate power supply that you must purchase as an individual item. The DCC power supply is really nothing more than a transformer, circuit breaker (to cut off power in the event of a short on your layout), and an on/off switch. DCC power supplies cost about $40. Next is the main DCC unit itself. 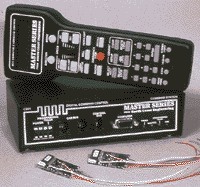 This is the "brains" of the system and is often called the Command Station or Booster. This unit has two functions: (1) it converts the AC input from the power supply to DC, and (2) it converts the continuous DC power to pulses of various frequencies, where each frequency will be sensed by an individual loco. The decoder card is a small circuit board that goes in each loco and is what enables it to pick up only the power frequency that is assigned to it. You must have one decoder card in each loco you want to run. These cards cost about $30.00 each. These are all of the required components. Most dealers who sell DCC systems will also sell you locos with the decoder cards pre-installed, or, if you are converting a standard layout to DCC, you can send them your locos and have your decoders installed for about $15.00. You can also install the decoder cards yourself, but this can be tricky depending on the type of loco you have, how much space it has inside it, and whether or not is was designed to be "DCC friendly." 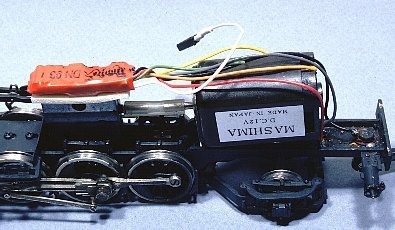 Several of the websites referenced at the end of this article contain detailed pictures and instructions for installing decoder cards in various types of locos. In addition to the above, there are two "nice to have" items that really tie the whole system together. These are some stationary decoder cards and a computer with a program for running a DCC layout. Stationary decoder cards are circuit cards that connect to the DCC Command Station. They allow you to control non-moving devices -- specifically turnouts. A typical stationary decoder card will control four devices, but you can find cards that handle more or less. Typical prices for a 4-unit card are in the $65.00 range. The reason the stationary decoder cards are nice is they let you control your turnouts from the same throttle you use to run your locos. To do this you simply select which accessory (turnout) you want to control, and then activate it. This means that with stationary decoder cards in place you need not have any turnout control switches, or the wiring required to support them. A computer is an excellent complement to a DCC system because it will connect to the DCC Command Station (via a standard serial port) and allow you to run a program with which you can control your entire layout. Specifically, the computer program will show a diagram of your layout and the position of each turnout. You can activate the turnouts by simply "pointing and clicking" them. So the PC lets you avoid building a control panel and you can thus eliminate all the wiring, lights, toggle switches, etc. that a physical control panel requires. Here is a screen shot of a different layout from the program I use to run my layout: http://www.discoverlivesteam.com/magazineold/92/mainscreen.jpg. Click this link to see the website for the software. My layout is about 10' x 15' in size -- I built it in my garage. I use a computer program called Railroad & Co. to run my layout. There are several things to note about the layout: first, as I stated at the beginning, the layout is a single circuit. It has no blocks, no insulated rail joiners, and no DPDT toggle switches. And of course there is no physical control panel. I do have multiple feeder wires to the various track sections, but there are no individual or electrically isolated sections of track. Second, each turnout has a number or letter associated with it (except for the yard area -- I haven't built that yet.) These numbers and letters are hot keys for controlling the associated device. So for instance, I can control the turnout at the top left by simply pressing the 4 key on my PC keyboard. The X key controls all 4 turnouts comprising the double crossover. Running trains on this layout is very prototypical: I select the loco I want to run by entering its number on the DCC handheld throttle. I turn a thumbwheel on the controller to get the loco up to speed. By glancing at the PC screen I can see how the turnouts are set and I can change them by simply pressing a key on the keyboard. When the loco is running on its route I can select another one and start it going. It makes no difference where the locos are on the layout; I can control any loco any time simply by selecting it with the throttle and changing its speed or direction. Birk Binnard is the owner and sole proprietor of this website. Birk has always been interested in model trains and built his first HO layout in his basement in the mid 70's. After moving to California (where most houses have no basements) he developed HOHoist, a mechanism for building a model railroad in your garage that still leaves room for your cars (http://www.birkbinnard.com/hohoist).